We offer programs to engage members of the wider community in meaningful and enriching experiences. Programs are generally extensions of the Center’s mission, and are designed to offer something for everyone. If you would like to host a public workshop or event at the center, please contact us. Do you have an idea for a program that you would like to see hosted at MFC? Are you interested in teaching something and think that MFC would be the perfect site for your event? Please email us with your ideas. We would love to hear them. Join us for a fourth annual evening of sharing favorite poems and nature writings. Each winter we’ve had rewarding discussions of our favorite writings that explore the ways awareness of Nature hints at Spirit (or divinity, or Yahweh / God / Allah, or Source, or whichever term is most meaningful to each of us) in ways that evoke the deepest and most sustaining mystery of our being. The setting of MFC, in the natural setting of the Friends Lake property, inspires our awareness of the restorative power of Nature for our ongoing work for peace, justice, community and sustainability, as we celebrate the center’s 25th year in 2019. We invite everyone to join this midwinter discussion. Invite your friends, and bring your own favorite poem(s) and short prose statements, to share with the circle. We’ll have refreshments, and pass the basket for contributions to the center’s ongoing operations. 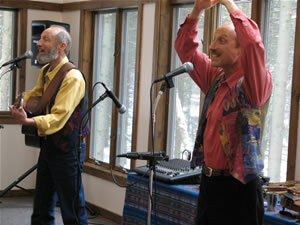 Gemini, twin brothers San and Laz Slomovits, nationally known for their music for children and families, return to the roots of their music — the classic songs of Pete Seeger, Bob Dylan, Peter, Paul and Mary, Joan Baez, Joni Mitchell, Simon and Garfunkel, etc. Come hear songs like “If I Had a Hammer,” “Blowing in the Wind,” “Where Have All the Flowers Gone,” “Big Yellow Taxi,” “Bridge Over Troubled Waters” and many more — and sing along with them! Fine multi-instrumentalists (guitar, mandolin, fiddle, and a variety of folk flutes and hand percussion) San and Laz add extra spice to the show with acapella versions of a Motown song, one by the Beatles, and even one by Janis Joplin! Rounding out the show, they include a few of their own original songs written in the style of the 60’s, as well as traditional songs associated with that era. This the music San and Laz grew up on, and they’ve put together a tribute / celebration concert of this quintessential music. We will meet at the Friends Meeting House in Ann Arbor to enjoy an evening performance by musicians Laz and San Slomovits and their friends. 9:00-4:00 on Saturday, March 2; Saturday, May 18; Saturday, September 14; and *UPDATE* Saturday, November 16. Suggested donation $30 or as able. Pre-registration requested; contact Carol Blotter at 475-0942. Each retreat is an opportunity to enjoy the quiet of the country while practicing sitting and walking meditation. This day is appropriate for anyone interested in meditation: beginners will have break-out instruction; experienced meditators can be in silence all day; those in-between can practice and have their questions answered. These retreats are fundraisers for the benefit of Michigan Friends Center. Contact Carol at (734)475-0942 or cb.meditate@gmail.com to register. Carol Blotter's meditation practice draws from dual roots in the Quaker and Buddhist traditions. She has been teaching since 1999 and has led more than 40 retreats across the United States and has taught over 50 classes in meditation to spiritual seekers, schools, universities and medical groups. She is a teacher for The Forest Way which is an organization dedicated to providing retreat opportunities conducive to spiritual growth that is both balanced and integrated. Donations appreciated. Please register in advance if possible. We will celebrate the longest day with a potluck dinner followed by a bonfire around which to share thoughts, stories, and songs. All ages welcome. Bring food to share and your own place settings. We will provide water and herbal iced tea. Bring something to share for after dinner as well-- a story, poem, song, some Solstice lore, or just your readiness to partake in what others have brought. This will be a time to explore various ways of celebrating the light. We welcome your spark. Bring long sleeves in case there are mosquitoes. We will celebrate the balance of day and night with a potluck dinner followed by a bonfire around which to share thoughts, poems, stories, songs, knowledge. All ages welcome. Bring food to share and your own place settings. We will provide water and herbal iced tea. Bring something to share for after dinner as well-- a verse, story or song you like, seasonal lore, a readiness to partake in what others have brought. What does this season mean to you? Bring flashlights, and long sleeves, and dress for the weather. We sit quietly in a circle and teach each other rounds, songs, and chants of the season as they occur to us. The woods around us, our sheltered circle focused on inner light, and our voices are the only elements of this simple celebration of the longest night. Anyone who enjoys singing and sitting quietly is welcome. You don’t need to be a singer--some just enjoy humming or listening. However most young children do not enjoy this event, since it does not involve any activity other than sitting and singing. We will celebrate the balance of light and dark and the birth of spring with a pot luck dinner and a circle in which to share thoughts, poems, stories, songs, knowledge. All ages welcome. Bring something to share -- a verse, a story, a song you like, seasonal lore, or a readiness to partake in what others have brought. What is this season saying to you? Dress for the weather and bring a flashlight. ©2003-2018 Michigan Friends Center. All rights reserved.